We have your Spring Break getaway all dialed in. There’s no better way to “break” than on the beach in Morro Bay. The warm toes in your sand, crisp refreshing cocktails and unforgettable adventures are exactly what you need to get through until summertime. 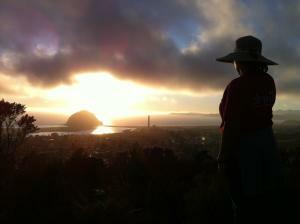 Most hotels are walking distance to the beach, Morro Rock and downtown areas. 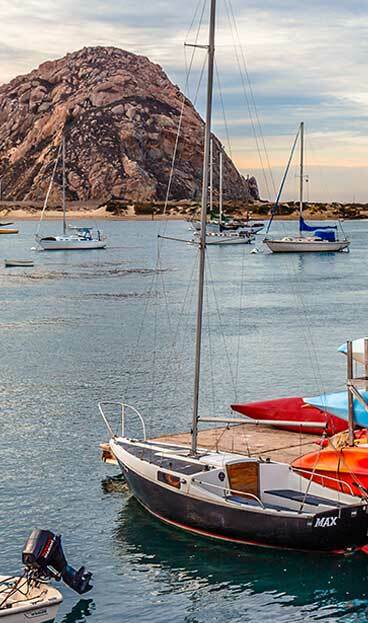 Whether you’re looking for a luxurious bayside hideout or a simple room to rest for the evening, Morro Bay has rooms for all. Find your hotel room HERE. One of the local’s favorite spots, The Siren stands proud on the corner of Harbor and Main with lots of space to dance, chat and enjoy. Check out their LIVE MUSIC SCHEDULE to catch a show while you’re in town. For those who prefer to spend an evening below the stars, there are many stunning vantage points to enjoy a drink in the moon’s company. 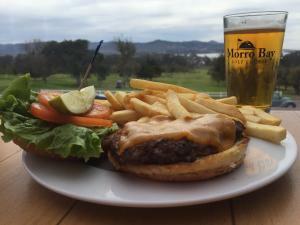 One of our favorite’s is Black Hill, just at the top of the Morro Bay Golf Course. This short walk will take you to one of the most breathtaking views in town. SATURDAY: THE DAY OF DEALS – All hotel guests March through May will receive a Spring Passport to savings at several restaurants, shops and rental stores. See the deals HERE. Morro Bay’s newest bakery, Buttercup Bakery, does not disappoint. Come enjoy a giant fresh breakfast pastry and one of the best cups of coffee you’ll meet. Use your passport to get a free cookie when you purchase your coffee. Save it for later, or have dessert for breakfast! 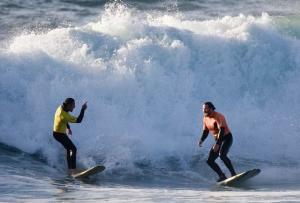 Surf’s Up: Get discounts on Surfboard Rentals! AzHiAziAM is the closest surf shop to Morro Rock with everything you need to catch the perfect wave. Use your passport for $5 off your rental/purchase (of $25 or more). After a morning in the sunshine, get your grub downtown at Pizza Port. This family-owned treasure is famous for the tantalizing aromas that greet you outside the restaurant as you walk by. Use your passport for a free salad with your pizza. We all have a sweet tooth, and Morro Bay has the perfect place to indulge a little. Grandma’s Frozen Yogurt and Waffle Boats is right across the street from Pizza Port. Your passport will get you and your friend a yogurt for the price of one! Spend the last few hours of daylight below the surface of the bay. Sub Sea Tours will take you through to watch life underwater. Sub Sea Tours facilitates epic whale watching excursions year-round. You will be awestruck at the majestic marine mammals that live just outside the bay. Check out their schedule HERE. Maximize your golf experience at our golf course, inside Morro Bay State Park. The refreshing smell of eucalyptus coupled with the glittering view of the bay is a recipe for a soul-cleansing day. Grab a beer at the bar, then head to the no-net driving range to hit a few balls along the side of the bay. Bring your passport to receive a free bucket of range balls. Wash it all down with a draft at STAX. A weekend of adventures is not complete without your favorite drink. Bring your passport for $2 off a draft beer. Be sure to check out the T-Pier, right next to STAX. This is a popular hang-out for our local sea otters. Come soon to see the otter pups before they grow up!